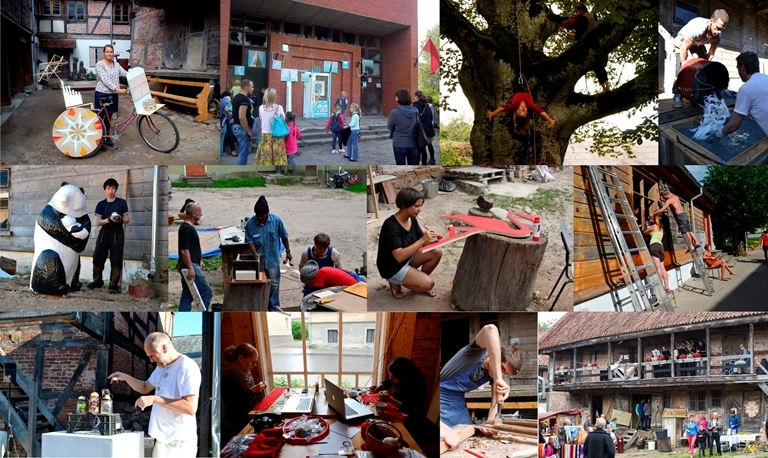 For the second time Workshop and Residencies centre SERDE is holding an International Restoration workshop in Aizpute, Latvia. Seven day workshop has been created to allow professionals (young, mid-career and master craftsmen) to meet outside their usual working environment and solve issues relating to wood-natural decay, rot, woodworms and replacement of heavily burnt, damaged construction parts both in theory and practice. Each participant will contribute with their own skills and knowledge in order to have the best possible outcome. All the practical work will be done on-site in 18th century wooden architecture complex which has been in a slow, thoughtful restoration process for the last decade. Participants will be introduced to the previous restoration works and knowledge gained from that. 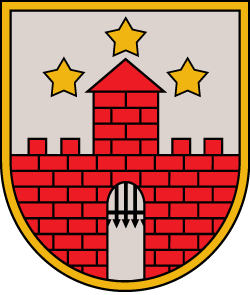 In addition to the workshop participants will be introduced to the cultural heritage of Aizpute County. During the workshop there will be organized guided tours to nearby cultural objects, lectures and other activities. 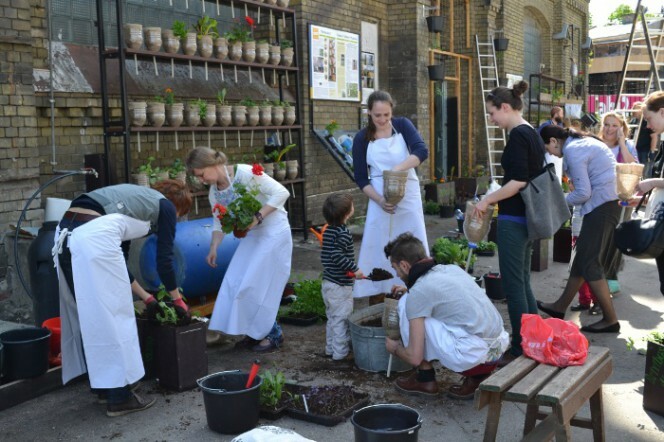 Workshop is a part of the Central Baltic Programme 2014-2020 project LiviHeri- Living with Cultural Heritage. The goal of the project LiviHeri is to learn how to live, maintain and cherish a historical town while preserving its characteristic environment and livability. Application procedure was closed on 30th of April. 11.00 Rasa Šmite (RIXC) “Fields. Techno-Ecological art practic. 12.00 Intro lecture from Latvian scientist Jānis Liepiņš and Anete Borodušķe about their collaboration with artists Gints Gabrans (LV) and Bartaku (BE). Public day - various artists presentations in the framework of Āboļušana (AppleThink) art and craft market in SERDE backyard and the Kultūras diena Aizputē (KDA) programme. Interdisciplinary art group SERDE's work and activity has been largely inspired by, and based upon these different aspects of cultural heritage noted above, and has included collaborations to explore human inter-relations with the local plant-environment and biodiversity. The following paragraphs give examples. The site of SERDE's art and residency centre is one of the oldest wooden buildings in Aizpute, and has been restored since 2002 by SERDE as both practical and pedagogical work in traditional construction methods. This work alone was recently recognised as a significant contribution to regional tangible cultural heritage. One of the first material installations they made in the town in the early years was an outdoor kiln for firing ceramics, according local tradition. Since 2007 they have also hosted an iron-casting symposium gathering local and international sculptors and metal-workers. So, development of physical infrastructure and workshops for making artefacts and art objects – wood, metal, ceramic – have developed in hand with the practice and enabling traditions of making and doing, inviting younger and established artists and makers get involved. Further, the ways of doing of local people and regional ethnic communities, including narratives of experiences have been documented in artist-led ethnographic expeditions and published in the Tradīciju Burtnīca (Exercise/Notebooks of Traditions) publication series. To give examples of maker and project developments, the earliest publication Brandava gatavošana Viduskurzemē [Moonshine/vodka making in Central Kurzeme] and related public demonstrations led towards a national innovation award in intangible cultural heritage in 2007. This work inspired a practice-led investigation into micro-brewing with local producers (Alus gatavošana [Beer brewing], 2009), and the development of new workshop facilities, and hosting gatherings of regional micro-brewers. Another publication, Vācēju kultūra Viduskurzemē / Foraging in Central Kurzeme (2010), documented the use of local plants and fungi in the region, a reflection of the human value of the biodiversity in the region still appreciated by some residents. This led to the ongoing artistic-research project 1 Ha Aronia Melanocarpa Power Plantation (2011-) by Bartaku, in collaboration with SERDE, which harvested Aronia berries and processed them into liquids (wine, beer, syrup) and foods (candy, jam) according to traditional and experimental methods or recipes; but has also inspired an experimental musical overture presented in Riga Capital of Culture 2014 programme. These processes encourage the idea that cultural heritage can be not only an inspiration, but a source of both tangible and intangible material, as well as a knowledge-resource for artistic works or artist-led or grassroots investigations. Artists, craft-persons, makers, and cultural workers can contribute in the innovative re-valuing of cultural heritage, by developing alternative or new ways of developing, sharing and communicating heritage, including new formats such as participatory and informal or recreational learning workshops. In doing so, it nourishes collaboration between artists, cultural associations with other researchers, professionals, small-scale entrepreneurs, as well as ennobles local residents and citizens who hold and maintain traditional knowledge and ways of doing. Resources are understood here as materials, services, skills, energy, talent, ability, knowledge or other assets, which are utilized to support and produce benefit, not only to individuals and associations, but larger communities such as municipalities, regions or wider groups of people. 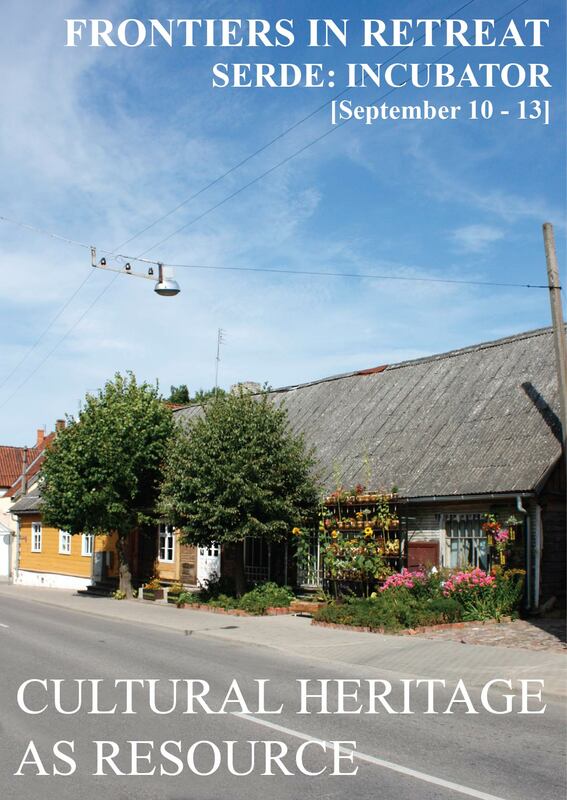 With this background in mind, the 'Cultural Heritage as Resource' event from September 10-13th 2015 in Aizpute gathers together persons from various disciplines - arts, design, science, heritage - to share and explore practice and methods. It has long been said that culture is developed from some abundance or surplus in the society or environment. 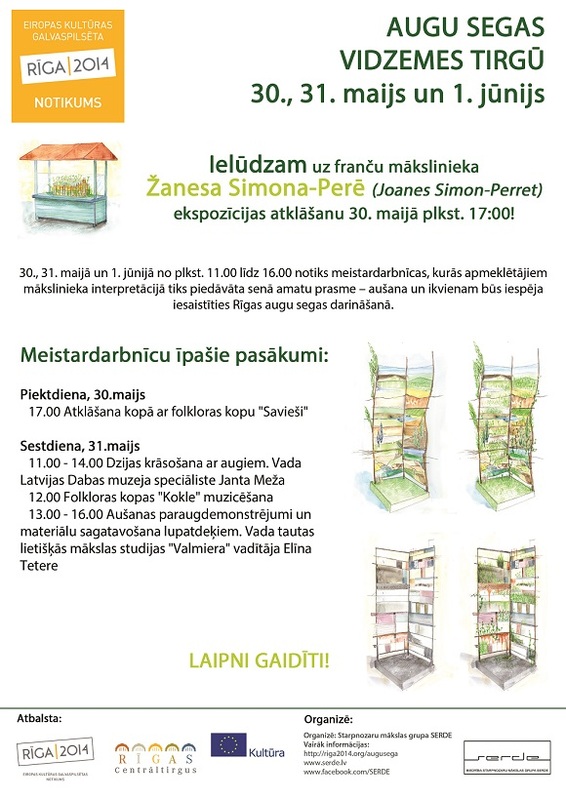 Coincidently, the occasion of gathering also takes place at the time of the annually-hosted Āboļošana (AppleThink) public event since 2012, where SERDE's residency artists and guests mix with local producers and craft-persons who share their products, both apple-based and otherwise. Apples (and Aronia berries) are an abundant local resource at this time of year and have associated traditions and ways of processing and conserving, for example juicing, preserving with sugar or fermenting to cider or wine. The gathering also takes place in the context of the HIAP-led 'Frontiers in Retreat' programme, which promotes the "necessity of multi-disciplinary approaches to the current ecological concerns and aims to develop means and platforms for this through methods of contemporary art". It is an occasion to extend into a wider interpretation of cultural heritage as resource--going beyond the tangible and intangible--to take into account natural heritage (ecosystems and biodiversity) which includes both Biotic (living things that make up an ecosystem) and Abiotic (non-living factors, eg. water, light, radiation, temperature, humidity, atmosphere, soil, stone) aspects. The inter-relationships and -dependences of these resources are also the conditions of life that we inherited from those who have came before us, that we maintain, or not, and that we pass on to those who will follow us in the future as previously or not. Resources can be classified as either Renewable (replenishing) or alternatively Non-renewable (finite, depleting, loss-y), but are often defined only from the perspective of whether they renew themselves in a time-spans meaningful to humans, rather than to non-humans. In-fact this human-centric perspective can lead to selfish and negative behaviours which are criticised as 'resource-hungry' or 'resource-grabbing', creating resource shortages. We cannot take for granted that they will continue to exist in the way that they currently do. There may be actual and potential resources existing at different times, and as well a s those that have been displaced from one ecosystem, culture or community for various reasons. Cultural heritage focuses our attention on the care and concern for the material and immaterial things that humans share in our environment, and the passing on of life-ways. It is sensitive to the sustainability of cultures and practices of value over longer durations of time. Conservation and stewardship provide ethics of responsible planning and management of resources, accepting or assigning responsibility to shepherd and safeguard the valuables of others. There is what Simon Thurley describes as a Heritage Cycle (2005), which gives an indication of how we can make the past part of our future: “By understanding (cultural heritage), people value it; By valuing it, people want to care for it; By caring for it, it will help people enjoy it; From enjoying it, comes a thirst to understand; By understanding it..” and so it goes round. However, what is considered valuable or heritage can change over time, compete with, and have different meaning for different stakeholders. To summarise, Artists, makers, cultural producers and interdisciplinary practitioners or researchers concerned about ecological issues can learn from due attention, cyclical care and concern of heritage, imagining where to enter the cycle. Likewise the cultural heritage field can learn from intuitive, critical and experimental ways of investigating, communicating and presenting cultural heritage. Together they can consider an expanded notion of resources which includes the biotic and abiotic environments we live within as inter-related and inter-dependent with our tangible and intangible cultural heritage. Arguably all are affected by an age of crises: ecological in the case of climate change or breakdown, but also social and economic changes, disruptions and displacements. Simon Thurley, Into the future. Our strategy for 2005-2010. In: Conservation Bulletin [English Heritage], 2005 (49). Serde is seeking artists to participate in Co- (lab) / Serde: collaboration and collectivity, an interdisciplinary lab, comprised of: performance, performing, dance, movement, theater, sound, and visual artists of various disciplines and levels, from university to professional. Led by artists in residence Jasmin Schaitl (AT) and William “Bilwa” Costa (US), participants will experiment with interdisciplinary collaboration, and will create site-relative scores and structures for performance and performance/installations, both inside and outdoors. Previous performance experience is not required. Participants are welcome to join one or more labs. All participants will have the opportunity to perform, or show, group and/or solo works during the Performance series. Participation in Co- is FREE. Visiting artists are responsible for their own travel and living expenses. Co- (lab) is a site-relative lab, comprised of: dance, movement, performance, sound, and visual artists of various disciplines and levels, from university to professional. Working solo, in small groups, and as an entire group, we will develop scores and performance material addressing the topics of collaboration and co-elaboration, or simultaneity. During the lab, we will focus on the specific physical characteristics of the studio, and other indoor and outdoor spaces; and how we, individually and as a group, relate and respond to them. We will use this research to create graphic scores for task-based movements, sound, and visual performances. Individually, and collectively, we will develop understandings of these scores, and how they can manifest into performances in different places. Using techniques of reduction and refinement, we will compose final scores that is based on all of the material generated during our lab. We will work individually, and as a group, focusing on the topic: collaboration and collectivity. -How do we create and/or perform collaboratively and collectively? -How does collaboration and collectivity influence, apply, or translate into a performance? -Can we perform collaboration and collectivity, literally and/or metaphorically? -Do they translate the same separately as they do conjoined? In addition to performances at the end of each lab, the project will culminate in a series of solo, duo, and group performances by participants, of both labs, on Fri. May 22, Sat. May 23, and Sun. May 24. Participating artists are welcome, and encouraged, to join one, two or all three labs, as well as the performances. Co- is a series of working groups, or labs, led by William “Bilwa” Costa and Jasmin Schaitl in which we employ methods from our solo, duo, and group practices, including Collective (3), as well as exercises derived from our workshop Performance as Practice, which originated as a semester-long workshop at University of Applied Arts In Vienna. Focused on a specific topic or topics, each group develops scores and performance material, which manifest in public performances at the end of each project. In July 2013, Jasmin Schaitl and William “Bilwa” Costa began a collaborative duo. Since then they have performed, led workshops, and have been artists in residence in Europe, US, and UK including: Vienna, Berlin, Opava, Helsinki, Turku, Pori, Tallinn, Tartu, Oslo, Poznań, Nürnberg, Bristol, Istanbul, New York, Philadelphia and Boston. Their work is a continuous process of: practice, assessment, reflection, accumulation, and reduction. The two artists have an ongoing series of performative actions, as well as interest in further research through leading workshops. Their performances address the physical relationship between two performers while exploring the correlation between, and potentials of: duration – ephemerality, proximity – distance, transformation – alteration, and duality – unison. Their goal is to reduce, minimize, and find the essence of each action. Application deadline for 12th International Cast Iron Art Symposium extended till 12th of April! The 12th International Cast Iron Art Symposium is part of the art and ecology events series. Artists are invited to use diverse raw materials and supplies for recycling and creating art works – old out-of-date cast iron radiators will be used during the cast iron art symposium. In the hands of professional artists they will be transformed into amazing masterpieces of art. The 12th International Cast Iron Art Symposium will be held from July 30 – August 9, 2015 at the Residency and workshop centre SERDE in Aizpute, Latvia. During the symposium we expect the artists to take part in the whole casting process and be able to work independently in the creation of molds. Melting and casting iron will be open to the general public and all interested audiences during the symposium days at SERDE and at night by the Tebra riverside. Cost of participation: The cost of participation is 400 Euros which includes catering, accommodation costs and materials for up to 20kg object (for bigger objects we offer cast iron for additional price). SERDE provides residents with accommodation (shared room) and working premises. We are looking for artists and creators who are professionals in their field and can relate to inter/trans- disciplinary processes; who are able to work independently and produce their work in unusual circumstances, but are also open for cooperation with local audience and hosts. Residencies duration 2-4 weeks for the period between 1 st of May and 1st of October, 2015. Thematic residencies - priorities will be given to the applicants who are interested to explore the rural and local context, society and environment. 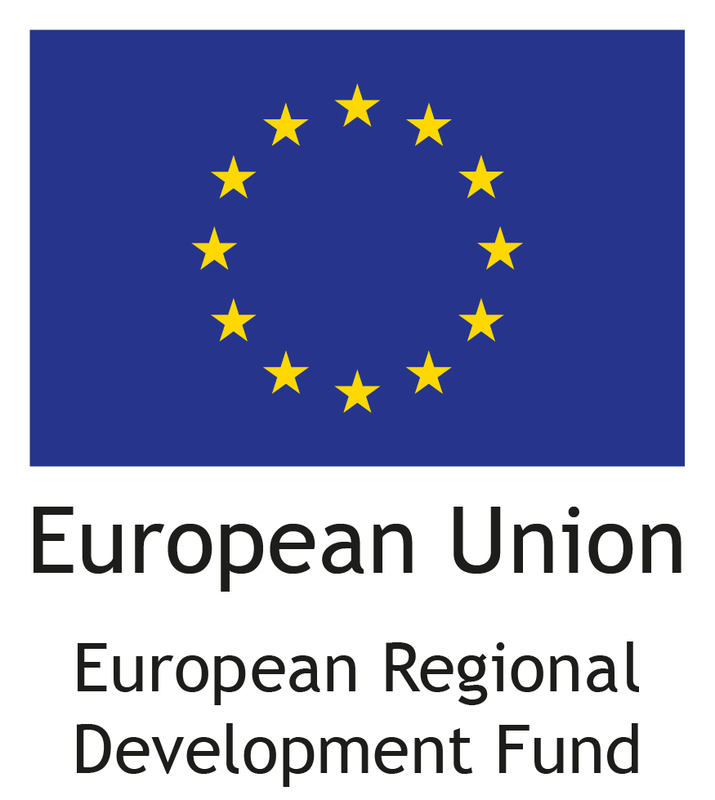 We provide selected candidates with letter of support for individual grant seeking. Few grants will be available for thematic residencies.